I have been behaving lately in the wax arena. 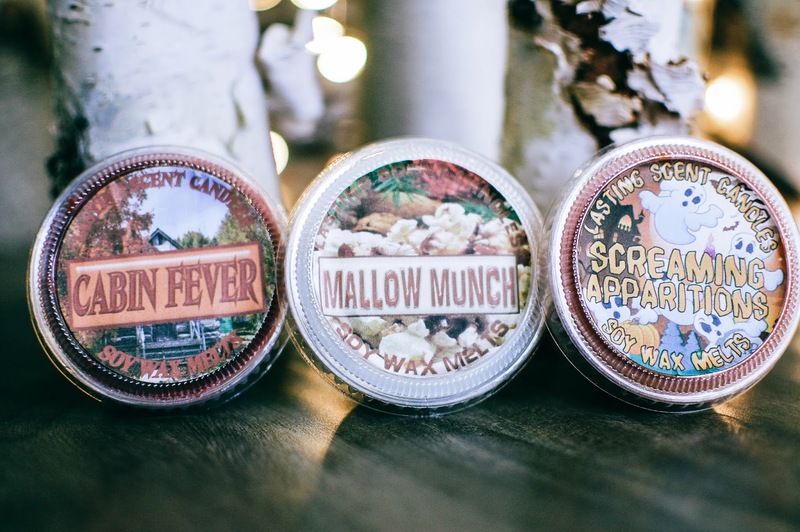 But anytime Lasting Scent Candles has an opening I try to pick up just a few favorites. This wee order was from the September 17th opening for fallish scents. I try to order only the 2 ounce scent shots since I can happily cut these in half and melt one half in my kitchen warmer and the other in my living area warmer. So I feel like I get more bang for my buck. The 2 ounce scent shots are $2.65 each. Dracula's Dungeon- Bad blogger here. I didn't screenshot the scent descriptions and they are long gone by now for this release so I will describe it by nose. I get soft honey sweet patchouli and dragon's blood. Maybe a softer version of nag champa. Regardless it is incredible and I am crying tears of regret for not getting more. Cast A Spell- This was a repurchase. I melted this a few days ago and loved the medium-strong throw and earthy, spicy atmosphere it provided. Happy to have another one on hand. Samhain- A sweet mellow blend that smells like it has a little bit of caramel apples and perhaps some creamy pumpkin and marshmallows. A very well blended fall scent with no spice. Cabin Fever- Another repurchase and favorite. Woods, leaves, apples and mahogany but smoothed with sweetness. Cozy and comforting. Mallow Munch- I wanted to try this so bad but I get way too much popcorn right out of the gate. Popcorn, caramelized sugar and a heavy bakery tone. Very much Moose Munchie without the chocolate. Screaming Apparitions- Repurchase! Pumpkins whipped with marshmallow and brown sugar. Delish. And melts wonderfully. 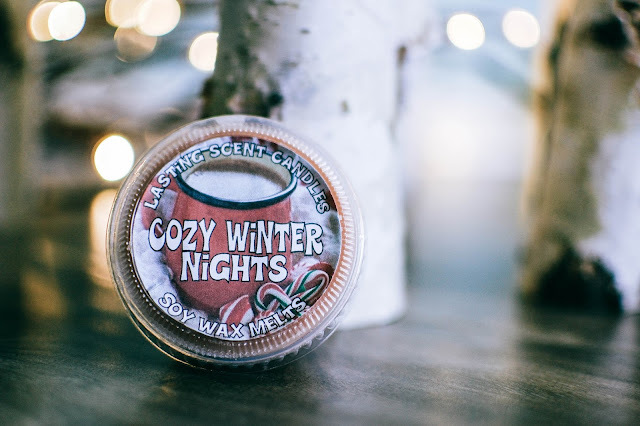 Cozy Winter Nights- This is one that I love despite it containing chocolate. 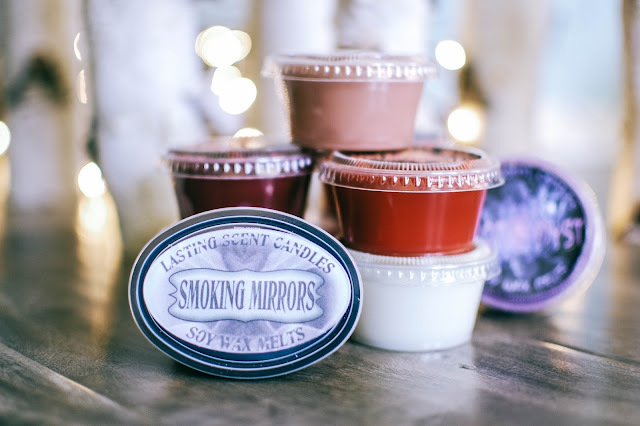 I think Lasting Scent Candles has the best chocolate note out there for my nose. It manages to smell creamy and soft like milk chocolate rather than like Tootsie Rolls. Add in peppermint and marshmallow and it is perfection. I had a sample of this last year and loved it so I snapped this one up with glee. Smoking Mirrors- This is one have bought in the past. It is a great Wild West scent of sweet leather. I believe it is leather, pomegranate and mahogany, sounds bizarre but it totally works. For me at any rate. Exotic Myst- This reminds me of Victoria Secret's Amber Romance but may very well be a different perfume dupe. A nice scent for a change of pace from fall/spicy/foodie scents. 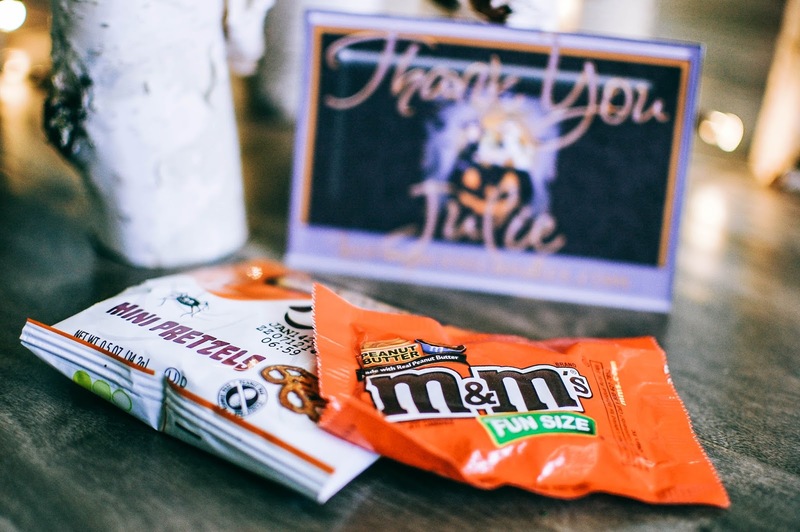 I also got a sweet surprise of candy and pretzels which were a nice snack at work. 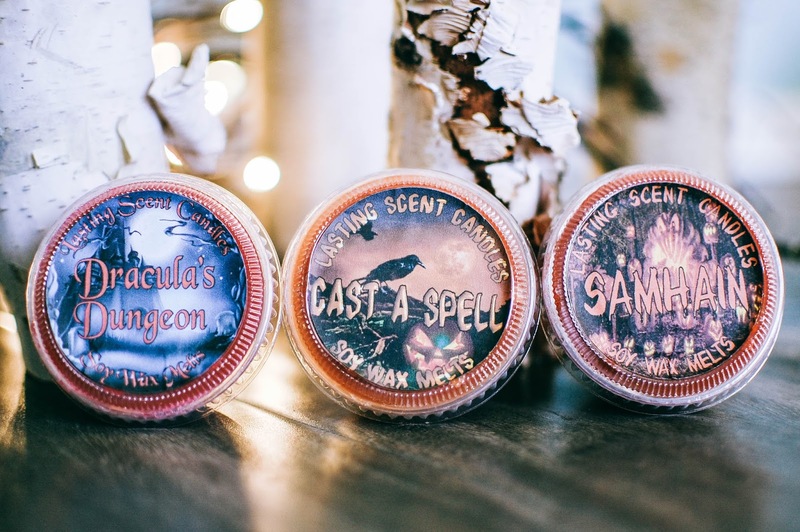 I placed another tiny order when LSC opened up for winter scents recently. I was running over an hour late to the opening but there was still plenty to choose from. Did you order any LSC recently? HA! No way Jose. I can only do LSC chocolate and even then once in a while. Badger can hit the road. Ew. Ew. Ew. Love LSC! I melted Cast A Spell a few days ago and have Pumpkin French Toast in the melting basket for this month. I am enjoying my first ever LSC order. Loved this review as these aren't scents that I ordered. Nice to see/read what other scents are like as well as the ones I chose. I will order from LSC again in the future as well. Awesome Leah!!! Was it from this fall opening too?? She had an incredible array of scents. I did buy pretty much a ton more last year. You can search Lasting Scent Candles in my sidebar to see reviews for more scents. 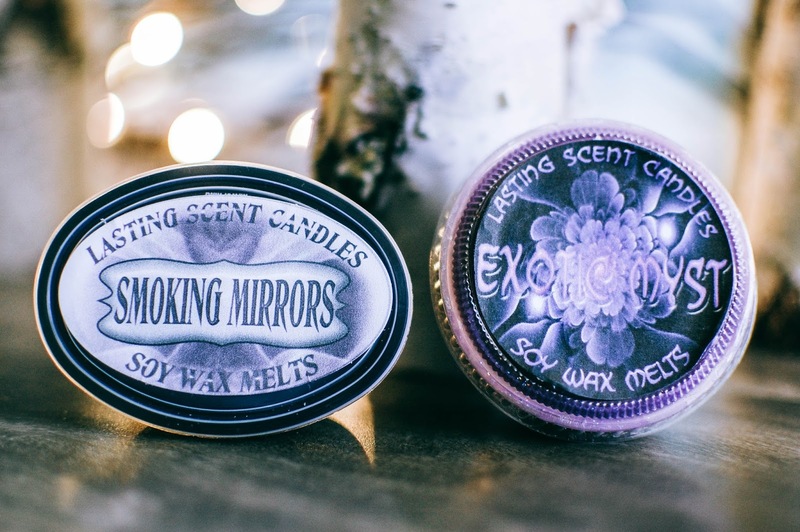 Did you grab any from the winter/holiday opening? I did but only a few. I still have some saved over from last year. But I have a feeling I will use them all up this year. What scents did you get? Ooh, I love your Lasting Scent posts - the little cups are so adorable. And not that you need it, but kudos to you for trying to reign it in. I'm kind of an "only if I can conceivably use this in a reasonable period" sort of melter, so I totally get that. Thanks!! I adore LSC. Pam really knows her stuff. I always get this really nice mellow sweetness from her tarts. Yes. I want to be just like you and get only what I need. So far it is working nicely. All my wax drawers have a nice amount of empty room in them. Who knows. I may even get it down to one three drawer set instead of the two I have currently. A vendor I have yet to try. Will have to put it on my list! Yes! LSC is worth it. I try to make sure that I get a little from her here and there when she opens.